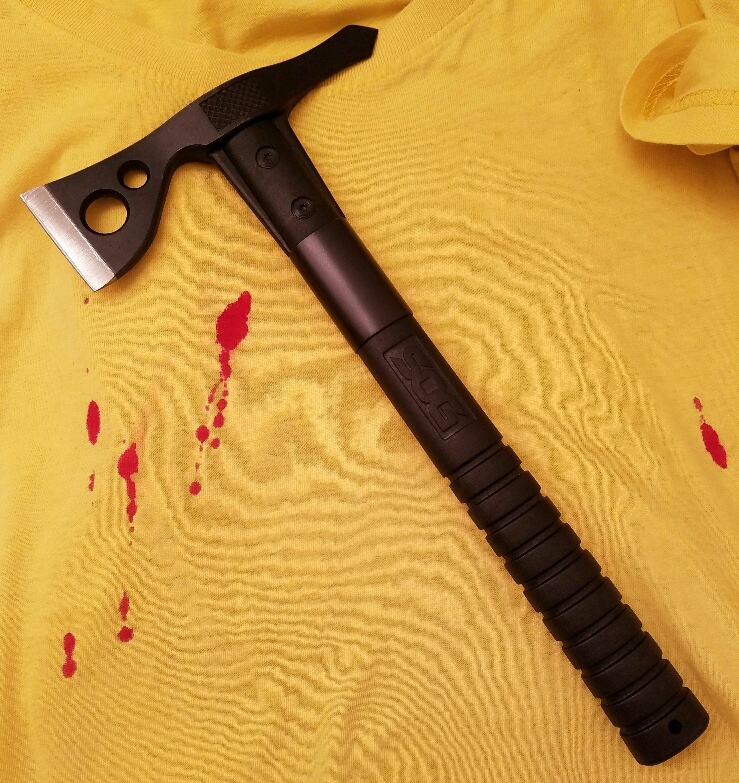 You may need to get yourself a tomahawk for serious zombie fights. Here's why: if Zombies ever do come your way, they may get up close and personal. They'll want to sink their gnarly rotten teeth into you and rip your bowels out with their bony fingers. You can shoot them, but the noise will only attract more. In a big city, most civilians will run out of ammunition before they run out of zombies in a shoot out. That's why you need a close combat weapon like a tomahawk. My personal choice for a tomahawk was the SOG FastHawk. It's made by SOG Specialty Knives & Tools. It's a small, fast, little tomahawk with a 2-inch blade with a spike. It's a lethal little tool. The spike looks like it could easily penetrate a zombie skull and the blade could do some serious damage. For weapons geeks, the blade and spike are made out of 420 RC 51/53 blade steel. A TOMAHAWK IS NOT A TOY! DO NOT "PLAY" WITH IT! A mistake or accident with a tomahawk can kill or seriously maim someone. You can injure yourself with the blade on the front swing and with the spike on the back swing. 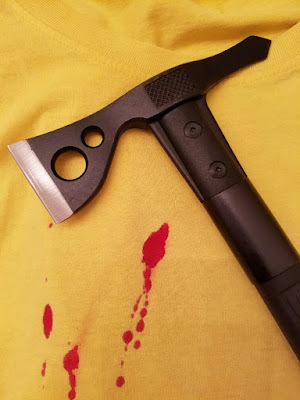 If you are looking for a tomahawk for mock combat or training purposes, this is NOT it. You'll need to look for specialized training weapons made from rubber or foam. At 19 ounces and 12 1/2 inches long, the SOG FastHawk (F06TN-CP) is about the size of a hammer. It has a glass reinforced nylon handle and a nylon carry sheath for your belt. It weighs about 19 ounces. By comparison, a typical Stanley nailing hammer weighs 16 ounces and is 13.3 inches long. At this small size and weight, the SOG FastHawk will let you land multiple blows against an adversary in quick succession. If this tomahawk breaks while you are knee deep in zombies, it will be small comfort to know that your FastHawk is covered by a lifetime warranty. Since it seems pretty sturdy, I don't that you'll need the warranty anyway. If you scour the internet, you'll find people using the SOG FastHawk for all kinds of macho camping adventures. However, I used it to beat the crap out of some cardboard boxes. It made short work of them. Both the blade and the spike penetrate thick cardboard with no problem. I'm pretty sure the SOG FastHawk will work on zombies, too. Overall, it is a great deal for less than $30.